Sydney and Inner West favourite burger joint Burger 10 is proud to announce as finalist of 2017 Australian Small Business Champion Awards (Fast Food/ Takeaway Store Category). The 2017 Australian Small Business Champion Awards marks the 18th birthday of the awards which celebrate and recognise the achievements of outstanding small businesses from all states and territories across Australia. Developed and managed by Precedent Productions, a small business it its own right with 30 years experience in managing successful awards programs. “The awards seek to acknowledge the hard work that business owners contribute to the local community in generating employment for millions of Australians, as well as their contribution to the Australian economy,” said Steve Low, Awards Partner & Managing Director of Precedent Productions. The Australian Small Business Champion Awards is the pinnacle of business success. They recognise the values associated with successful small businesses. These values include service, commitment, leadership, endurance, courage, innovation, performance, persuasion and generosity, Steve concluded. “We are extremely thrilled to be selected as Finalist from over 1,400 entries received this year. 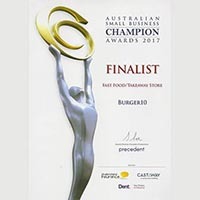 It is such an honour to be nominated and acknowledged as an elite Australian small business in the Fast Food/ Takeaway Store category, said Hussein Jaber, Director/ Executive Chef of Burger10. Burger 10 staples ten uniquely handcrafted burgers bringing the best flavours of 10 different countries from across the globe. Burger 10 has recently been awarded as 2016 City of Sydney Business of the Year & Outstanding Fast food and Takeaway by Inner West Local Business Awards.